I know you guys are going to want to make a million of these! They're so fast and fun and useful. I'm already planning several for friends. 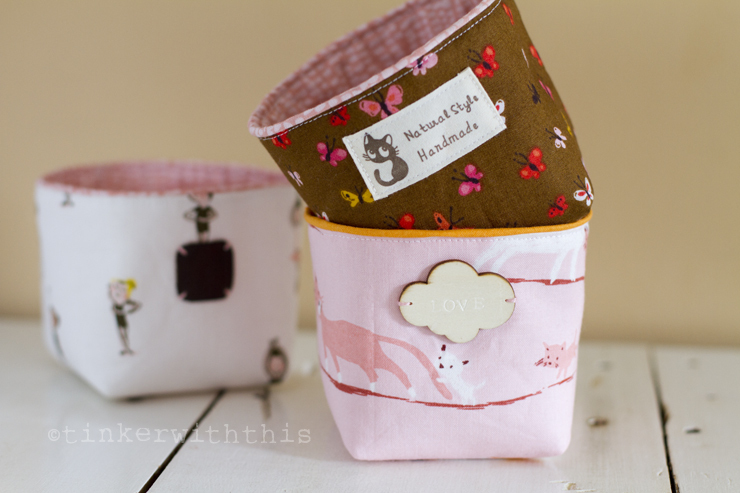 these three are currently living in my sewing space and holding all sorts of things like pincushions, clover clips and rolls of thread. 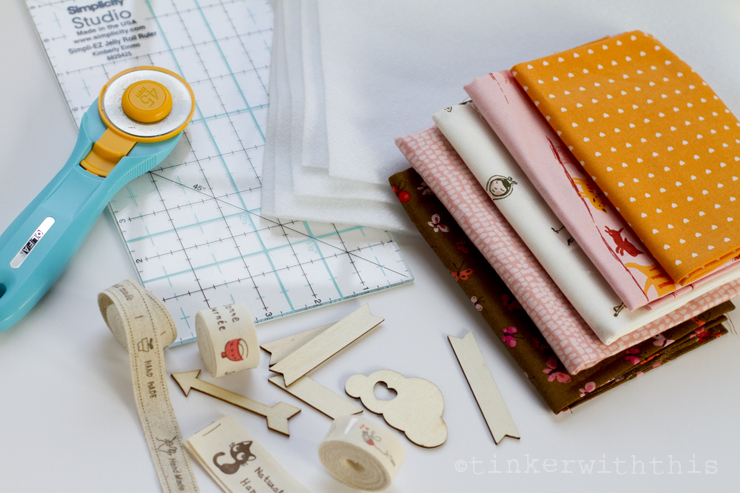 Start by gathering your supplies: coordinating exterior and interior fabric, embellishments and some thicker fusible interfacing. Cut four 5.5"x7" pieces of fabric, two from your exterior fabric and two from your interior fabric. Now cut two 5"x6.5" pieces of fusible interfacing. (These are horizontally laid out.) 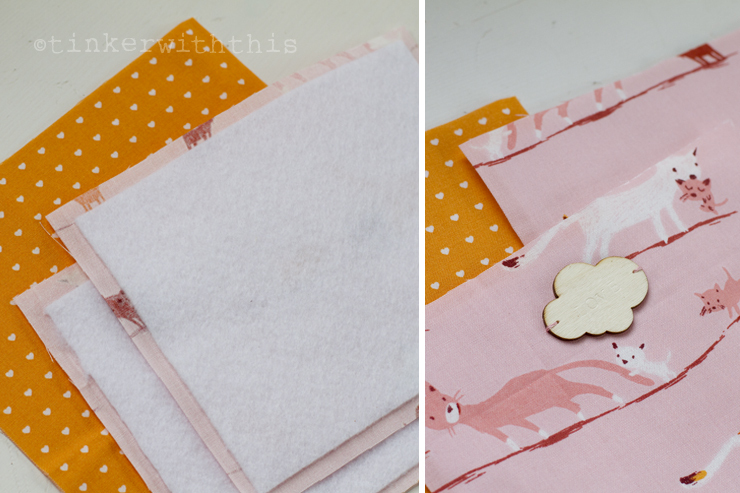 Now iron your interfacing onto the backs of your exterior fabric pieces. At this point you can choose your front piece of exterior fabric and stitch on your embellishment choice. Once you have that done, place the right sides of your interior fabric pieces together and stitch along the sides and the bottom, leaving an opening at the bottom, about 2.5" long. See my purple guidelines in the top left photo. Take the exterior fabric pieces and place right side together. 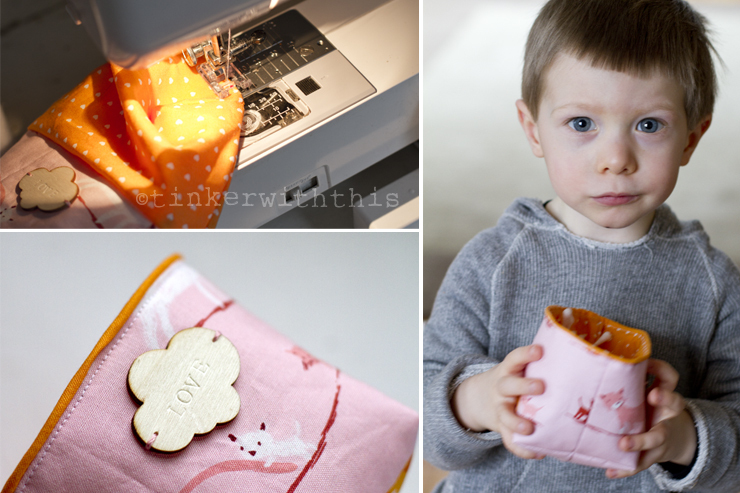 Machine stitch along the sides and bottom using your interfacing as a guide. 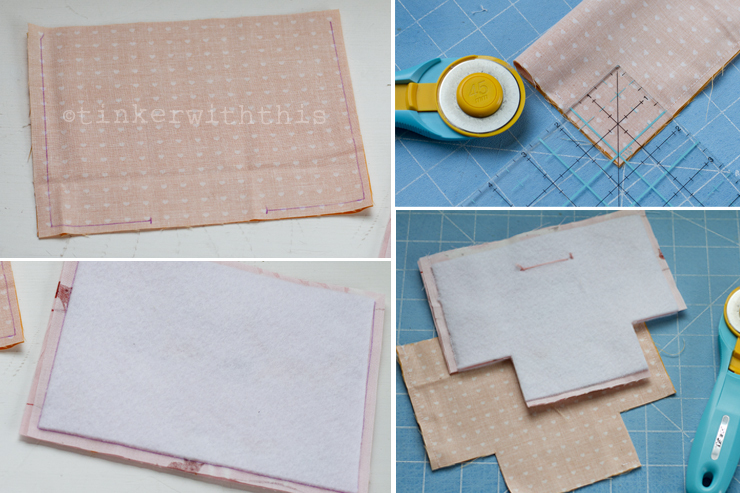 Now cut out 1.5" squares from the corners, lining up your ruler with your stitches and measuring from there. See the lower right picture. Now machine stitch the corners together on both pieces so you have flat bottoms. Put the interior fabric inside your exterior, right sides facing and machine stitch along the top to join your pieces together. 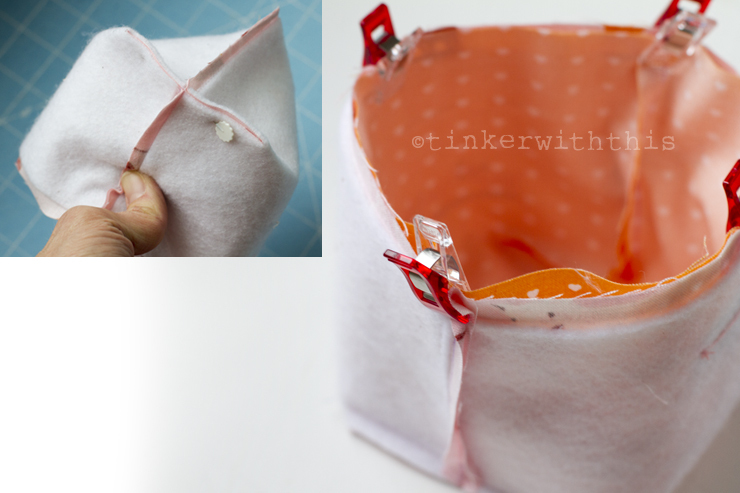 Flip the basket out through your bottom opening in the interior fabric. Once you've got it turned the right way out, you can close up your lining opening and machine stitch it closed. Now position your interior lining just a bit over the top edge and top stitch to finish your basket. 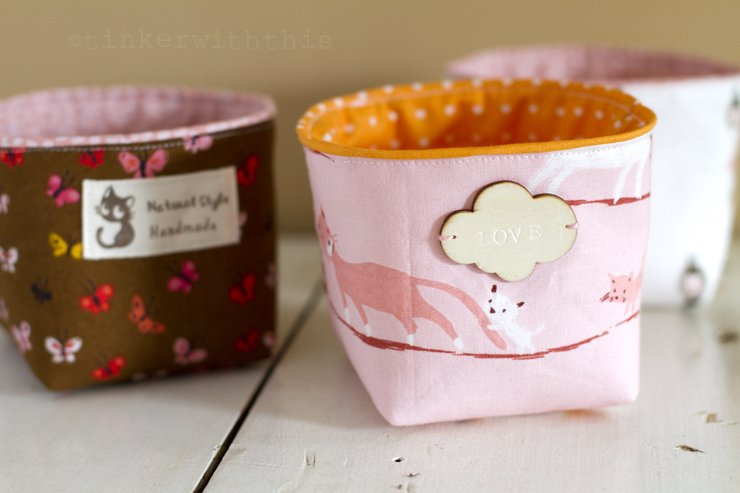 You now have a cute little fabric basket! Go ahead, make a whole lot more, you know you want to! Okay guys, I hope this is helpful for you and if you're on Instagram, use the hashtag #tinytinkbasket so I can see your creations. Happy crafting! Love how simple and tiny these are!!! Thanks for the tutorial. So darn cute!! Thanks for the tutorial--I am hoping to try one (or three!!!) out this weekend! I am having fun just thinking of the fabric choices to be made here and the embellishments!! So fun!! Thank you!! !